It is helpful in planning treatment for patients with ductal carcinoma in situ (DCIS) if the size and grade could be reliably predicted from the mammography. The aims of this study were to determine if the type of calcification can be best used to predict histopathological grade from the mammograms, to examine the association of mammographic appearance of DCIS with grade and to assess the correlation between mammographic size and pathological size. Mammographic films and pathological slides of 115 patients treated for DCIS between 1986 and 2000 were reviewed and reclassified by a single radiologist and a single pathologist respectively. Prediction models for the European Pathologist Working Group (EPWG) and Van Nuys classifications were generated by ordinal regression. The association between mammographic appearance and grade was tested with the χ2-test. Relation of mammographic size with pathological size was established using linear regression. The relation was expressed by the correlation coefficient (r). The EPWG classification was correctly predicted in 68%, and the Van Nuys classification in 70% if DCIS was presented as microcalcifications. High grade was associated with presence of linear calcifications (p < 0.001). Association between mammograhic- and pathological size was better for DCIS presented as microcalcifications (r = 0.89, p < 0.001) than for DCIS presented as a density (r = 0.77, p < 0.001). Prediction of histopathological grade of DCIS presenting as microcalcifications is comparable using the Van Nuys and EPWG classification. There is no strict association of mammographic appearance with histopathological grade. There is a better linear relation between mammographic- and pathological size of DCIS presented as microcalcifications than as a density, although both relations are statistically significant. Breast conserving therapy is now an accepted treatment modality for ductal carcinoma in situ (DCIS) of the breast. It is even suggested to omit radiation therapy after local excision under special circumstances that include small size (the lesion must be smaller than 3 cm), surgical free margins (the margins must be at least >1 cm free of tumour), and low or intermediate histopathological grade . Pathological size, surgical margins and histopathological grade are all independent predictors of recurrence that has been defined in the Van Nuys Prognostic Index . Inadequate surgical margin seems to be single most important prognostic factor for recurrence . It would be helpful in treatment planning if the size and grade could be reliably predicted from the mammogram. Mastectomy is still the golden standard in the treatment of DCIS of the breast involving large areas of DCIS (>4 cm), multiple locations and in patients where radiation therapy is contraindicated . Several histopathological classification systems have been developed in the last decade to segregate lesions with a good prognosis from those with poor prognosis. Two classification systems that are mostly used are the European Pathologist Working Group (EPWG or EORTC) classification and the Van Nuys classification [4–6]. The DCIS is classified as high (3), intermediate (2), and low (1) grade. Essential difference between the two classifications is that the EPWG classification is based on nuclear grade and cell polarization and the Van Nuys classification uses nuclear grade and the presence of necrosis [4–6]. A previous study evaluated both classification systems in relation to relapse free survival after breast conserving therapy and found no statistical difference between the groups . There was an overall agreement between observers in 79% for the EPWG classification and in 64% for the Van Nuys classification . With the introduction of stereotactic large core needle biopsy it has become possible to obtain a preoperative diagnosis of nonpalpable breast lesions. As most DCIS lesions are nonpalpable and some are more extensive than suspected on the mammogram, evaluation of mammographic-pathologic correlation by a multidisciplinary team is essential in the assessment of patients to determine their eligibility for breast conserving therapy, and to achieve complete surgical resection with wide free margins and a cosmetically acceptable result. This study was carried out to determine which classification can be best used to predict histopathological grade from the mammography, to examine the association of mammographic appearance with histopathological grade and to assess the correlation between mammographic size and pathological size of DCIS. The outcome of these correlations can be used to facilitate preoperative selection of patients and planning wide local excision. Data of all patients who were treated for DCIS of the breast at the Martini Hospital between 1986 and 2000 were selected from the database of the departments of pathology and surgery. Patients (n = 115) for whom both mammograms and pathological slides were available were included in the study. The cranio-caudal and mediolateral oblique mammographic films were subjected to review by a single radiologist (R.M.P.) with special expertise in mammography without knowledge of the histopathological subtype. The mammographic appearance was recorded as microcalcifications, a combination of microcalcifications and a density and an abnormality other than microcalcifications. Microcalcifications were classified as linear, coarse granular, fine granular or a combination of these, as defined by Holland and Hendriks [8, 9]. The amount (≤10 or >10), distribution (cluster or segment) and centricity (uni- or multicentric) of microcalcifications were recorded. A mammographic abnormality other than microcalcifications was classified as asymmetry, density, star lesion or distortion of architecture. Size of the lesion was measured as the largest diameter on the mammogram in centimeters. Pathological slides were reviewed by a single pathologist (A.D.G.) with special expertise in breast pathology who was blinded of radiographic characteristics of the cases. Macroscopic characteristics like volume and weight of the excision specimen and the number of tissue blocks were obtained from the previous pathology reports. Microscopic findings that were being characterized consisted of histopathological grade, size and margin status. The histopathological grade was characterized according to the EPWG and Van Nuys DCIS classification [4–6]. The extent of the lesion was microscopically estimated by the number of positive slides in relation to the extent of sampling. To examine which classification could best be used to predict histopathological grade from mammography a prediction model was created for the EPWG and van Nuys classification. Because the majority of cases were presented as microcalcifications this group was used for the prediction model. The data was processed in SPSS® 11.0 for windows database (SPSS, Chicago, Illinois, USA). 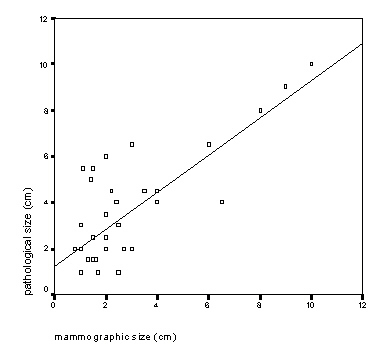 The relation between mammographic and pathological size was determined by linear regression and was expressed by the correlation coefficient (r). Association between mammographic features and histopathological grade was evaluated by the χ2-test. Significant parameters were evaluated for microcalcifications in a prediction model for both pathological classifications by ordinal regression. A p-value of ≤0.05 was considered significant. Mean age of the patients was 59 years (median 57 years). Mean size of microcalcifications was 3.8 cm (median 3.0 cm) and mean size of an abnormality other than microcalcifications was 2.7 cm (median 2.0 cm). Mean pathological size was 3.6 cm (median 3.0 cm). The study population's clinical, radiological and pathological parameters are summarized in Table 1. Of the 87 patients with microcalcifications, the EPWG classification model correctly predicted the histopathological grade in 59 (68%), while theVan Nuys classification model correctly predicted the histopathological grade in 61 (70%) cases (Table 2). It was concluded that there is no difference between both classifications, and hence, we continued this study using the EPWG classification as this classification is generally used in the Netherlands. Clinical, radiological and pathological characteristics. Prediction models for the EPWG and Van Nuys classification for microcalcifications. The association between mammographic characteristics and histopathological grade is detailed in Table 3. Presence of microcalcifications (p = 0.008) and presence of linear microcalcifications (p < 0.001) was found to be associated with high grade DCIS, while presence of fine granular calcifications was more often associated with lower grade (p = 0.048). A multicentric distribution of microcalcifications was only present in high grade DCIS (n = 4). Association between mammographic characteristics and histo-pathologcal grade according to the E.P.W.G. classification. Mammographic and pathological size is shown in scattergrams (Figures 1 and 2). 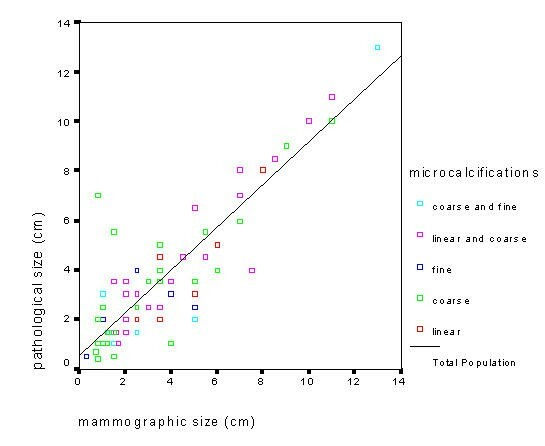 The linear correlation between mammographic size of microcalcifications and pathological size was high (r = 0,89, p < 0.001). Regression line fit equation: pathological size (PS) = 0.55+0.86 × Mammographic size (MS). In 7 cases of microcalcifications there was a large discrepancy (>2 cm) between pathological and mammographic size. Of these, in only 2 cases mammography underestimated the size. These 2 cases were both presented as coarse granular microcalcifications and histopathological grade was 1 and 3. The linear correlation of DCIS presented as an abnormality, other than microcalcifications was lower (r = 0,77, p < 0.001). Regression line fit equation: pathological size (PS) = 1.24+0.80 × Mammographic size (MS). In 7 cases there was a large discrepancy (>2 cm) between mammographic and pathological size. In 6 of these cases mammography underestimated the size. This study demonstrates that there is no difference between the EPWG and Van Nuys classification in prediction of grade of DCIS from mammography when seen as microcalcifications. However, there is no association of mammographic appearance with histopathological grade. A linear relation was found between mammographic and pathological size in DCIS lesions presented as microcalcifications. As most DCIS lesions are nonpalpable at presentation they are more difficult to excise completely. A good correlation of mammographic and pathological size and histopathological grade of DCIS might help in determining treatment. If wide local excision is decided as the treatment this may help the surgeon in better planning the excision and achieve tumour free margins while providing a cosmetically acceptable result. The reliability of estimating preoperative size by mammography in DCIS is debatable. Size of linear microcalcifications is best predicted on mammographic films. Coarse and fine granular microcalcifications show non-significant relation [8–10]. This study showed a good correlation between the size of microcalcifications and pathological size irrespective of type of microcalcifications. Pathological size of a mammographic abnormality other than microcalcifications has demonstrated a less reliable correlation. In 6/37 cases there was a mammographic underestimate of pathological size of more than 2 cm. In all cases the mammographic appearance was that of a density. A density on mammography is correlated with a large concentration of DCIS affected ducts on pathological examination with an epicentric extent into the periphery. It could be possible that only the large concentration of DCIS is presented as a density on mammography. The epicentric extent of DCIS into the periphery might not be visible on the mammograms. Most studies on mammographic appearance of DCIS describe microcalcifications and there are only a few studies on mammographic density and DCIS [11–17]. Reports on association of mammographic appearance with histopathological grade are conflicting [11–17]. Most studies examined only the dominant mammographic features in relation to histopathological grade. The general conclusion is that there is considerable overlap between mammographic characteristics and grade and that it is difficult to predict histopathological grade from mammography. We examined all present radiological characteristics and found several associations of mammograhic appearance with pathohistological grade. Nevertheless using ordinal regression a prediction rate of only 70% could be established. Inter- and intra-observer variability still remains a problem in classifying microcalcifications. Pijnappel revised microcalcifications of 533 mammographic films together with a fellow radiologist. After six months a random sample of 100 out of these 533 mammograms were re-examined and classified by the same two radiologists showing a moderate intra-observer agreement . Van Nuys classification demonstrated greater inter-observer variabiltity than the EPWG classification (64% vs 79% overall agreement) . With the introduction of stereotactic large core needle biopsy (SCNB) it has become possible to obtain a preoperative histological diagnosis in nonpalpable breast lesions. The COBRA-study, evaluating 973 patients with impalpable breast disease with SCNB and subsequent needle localised open breast biopsy, showed SCNB to be an accurate instrument for the diagnosis of nonpalpable breast disease which can reliably replace needle localized open breast biopsy . Histological diagnosis in case of microcalcifications seems to be less reliable when obtained with SCNB . We believe that careful correlation of mammographic appearance and histopathological classification by a multidisciplinary team (radiologist, pathologist and surgeon) can help improving diagnostic accuracy and assessment of patients for surgery. Mammographic size of DCIS presented as microcalcifications can be generally used as an estimate of the pathological size when deciding on local excision. In case of a density on mammogram there is a greater chance of underestimating the size, which means that the surgeon should perform a wider excision in these cases. If SCNB is available this method should be used to determine histopathological grade of DCIS. Mammographic appearance can still be helpful in determination of a good mammographic-pathologic correlation. There is no preference for using the EPWG – or Van Nuys classification in prediction of histopathological grade of DCIS presented as microcalcifications. MdR: generated the idea of this study and carried out the literature search, most of the analysis of data and the writing of the article. RMP: reviewed all mammographic films together with MdR and participated in the writing of the article. WJP: conducted statistical analysis together with MdR. JdV: participated in the idea and design of the study, participated in the literature search and the writing of the article. PCB: participated in the idea and design of the study, participated in the writing of the article. ADG: reviewed all pathological slides and participated in the writing of the article.